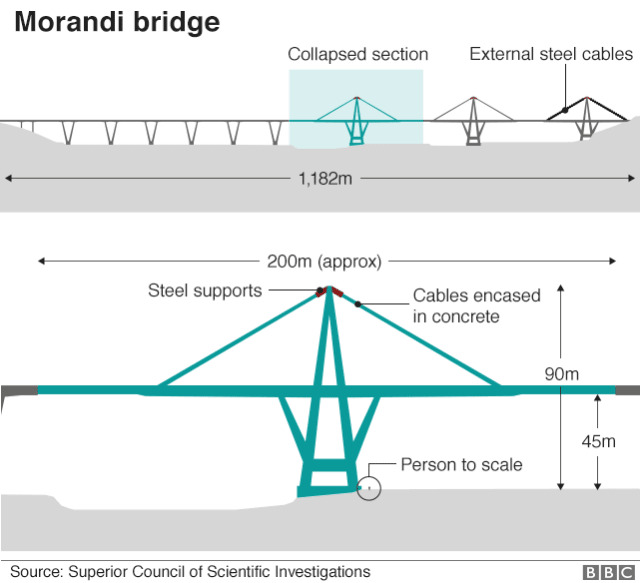 Italy’s Morandi Bridge Collapse—What Do We Know? 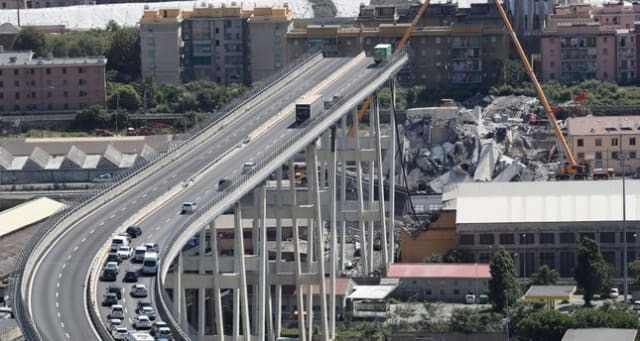 On Aug. 14, Morandi Bridge in Genoa, Italy, collapsed, sending vehicles and tons of rubble to the ground 150 feet below and killing 43 people. Witnesses said the bridge was struck by lightning during a thunderstorm before it crumbled, though lighting alone should not have felled the bridge. Preliminary investigation points to a combination of poor design, questionable building practices and insufficient maintenance. The Morandi Bridge, finished in 1967, is named after the civil engineer who designed it: Riccardo Morandi, who died in 1989. Before its collapse, it stretched 3,878ft, connecting the A10 motorway toward France and A7 to Milan. Popular for both commercial traffic and local vacationers, the bridge formed an arterial connection between France and Italy. The bridge was very much a signature Morandi piece. The cable-stayed bridge deck was made from reinforced concrete. The cables linking the towers to the deck were covered in concrete. 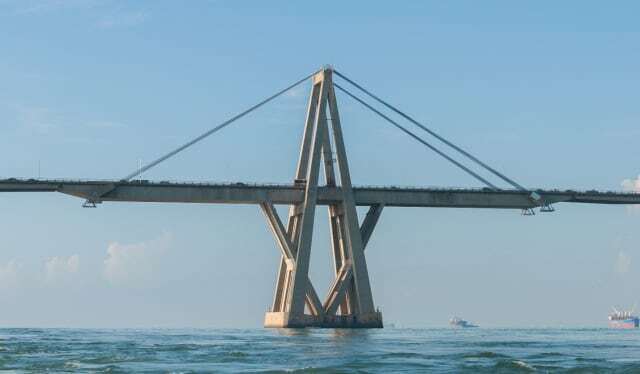 Like Morandi’s 1957 design for the General Rafael Urdaneta Bridge in Venezuela, the trestles of the bridge formed a double V: one of the Vs carried the roadway beam, while another one, upside-down, supported the upper tie rods. On the morning of the incident, Genoa was hit by a fierce thunderstorm. Just before noon, a 300ft section of the highway collapsed, falling almost 150ft to the ground. A diagram of the bridge, showing the section that collapsed. According to Angelo Borrelli, Civil Protection Department chief, the collapse took approximately 36 cars and three trucks down with it. Motorists on the bridge weren’t the only ones at risk; apartments and houses built under the bridge were crushed or had to be evacuated. As hundreds of volunteers and professional emergency workers searched the wreckage for people, still-hanging sections of the bridge creaked ominously overhead. The death toll now stands at 43. In the days after the tragedy, mounting public anger has led to a search for causes: Was neglectful maintenance, shoddy workmanship or poor design to blame for the collapse? For those seeking answers, the problem isn’t finding one possible solution. It’s determining which of the bridge’s many faults finally caused it to collapse. The main difference between the cable-stayed bridge and its close cousin, the suspension bridge, is that cable-stayed bridges lack the primary cables that connect towers to one another. They rely only on the cables that pass from tower to road. Most cable-stayed bridges have multiple stays that fan out from the towers and attach to multiple points on the deck. This helps distribute the forces on the deck. Morandi’s bridge only had two stays per tower, one on each side. The composition of these stays was unique. Most cable-stayed bridges have stays made of woven metal cables. 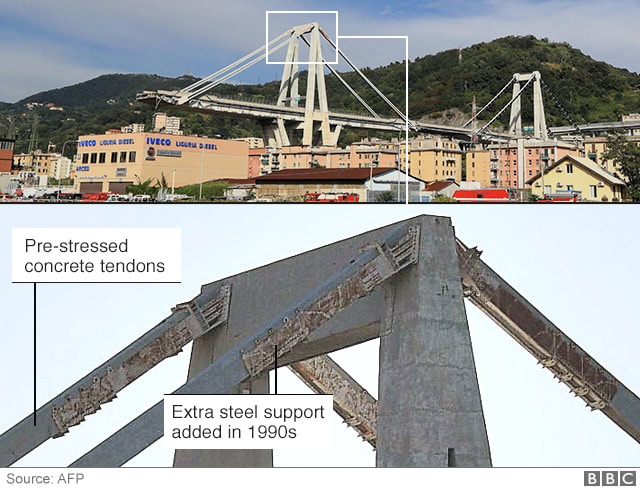 Instead, Morandi used prestressed concrete around tie-rods, making it impossible to see the condition of the metal underneath. Neither of these choices are optimal for building a stable bridge. The small number of stays would have made it more difficult for the bridge to stay standing if one element failed. Cable-stayed bridges in particular rely on a precise balancing of weight. With only a pair of stays on each side of the tower, the failure of a single stay could have caused enough load shifting to overburden the other structural elements of the bridge. Covering the reinforcing metal with concrete would, of course, make it impossible to see the condition of the metal reinforcements. Indeed, an investigation into the bridge in 2017 was unable to determine if the reinforcement had corroded. Corrosion in the cables can be caused by chloride buildup in the concrete, which is more often the case in a marine environment, Matteo Pozzi, Department of Civil and Environmental Engineering at Carnegie Mellon University associate professor, told the New York Times. Not everyone believes that the choice to pre-stress the concrete would have made the stays any stronger. In 2016, ingegneri.info spoke to engineer Antonio Bercich about the bridge’s design. Bercich offered an indictment of many of the design choices, focusing on the futility of pre-stressing the concrete. To support his point, he brought up the fact that the bridge and its sister bridge in Venezuela needed to have additional stays added to support the deck. The Venezuela bridge had a cable snap after corrosion weakened it. When the Morandi Bridge was built, encasing a cable in concrete was innovative. However, because of all of these flaws, there are few bridges that use this type of construction. The Morandi Bridge was part of a privately owned toll highway system looked after by construction and maintenance company Autostrade per l’Italia. In the wake of the collapse, there have been questions about exactly how frequently, and thoroughly, maintenance was performed. 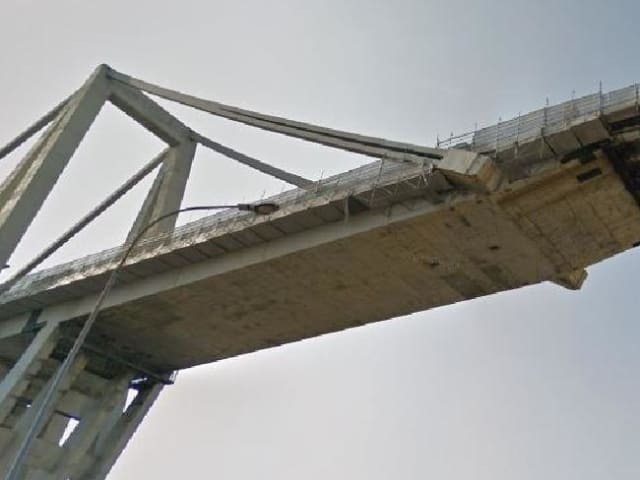 While few close-ups of the bridge before the collapse exist, this Google Maps image shows black spots that are believed to be spot repairs to the concrete. According to Autostrade, the company has spent over a billion euros ($1.15 billion) maintaining and improving its highways over the past five years. The Morandi has been a particularly costly investment. It’s been under almost-constant restoration since the 1970s. As early as 1979, Morandi wrote a report that recommended constant maintenance of the bridge to fill in exposed pieces of reinforcement and remove rust. Morandi blamed the bridge’s fragile state on a “well-known loss of superficial chemical resistance of the concrete” caused by sea air and airborne pollution from a nearby steel plant. The bridge continued to need extensive maintenance throughout the 90s the 2000s and into the 2010s. In his 2016 report, Bercich called the bridge a “failure of engineering” and said that the costs of maintenance would soon outstrip the costs of building a new bridge. A close-up image of the bridge’s reinforced concrete stays, along with the extra support added 30 years ago to help them carry the weight of the bridge. A study commissioned in 2017 warned of anomalies in the way that some of the stays reacted to vibration, but the concrete made it impossible to see if anything was wrong with the metal underneath. In May, Autostrade announced a 20-million euro ($22.8 million) call for tenders on structural repairs. Indeed, one area resident told the New York Times that they had seen workers doing repairs on the portion of the roadway that would collapse the next day. The Morandi Bridge was built during the 1960s, a construction boom in Italy. The era’s legacy is a mixed one because many of the structures built then are starting to fall apart now. Part of the problem was corruption. Mafia involvement in public infrastructure meant that many of the projects were built with under-reinforced concrete and made with too much sand and water. Nicola Gratteri, the anti-mafia chief prosecutor in Calabria province, told the Guardian that he had found cement “with a resistance three times weaker than the norm” during his investigation into tunnels and bridges. Reinforce concrete has a finite lifespan to begin with—50 to100 years is the industry standard. 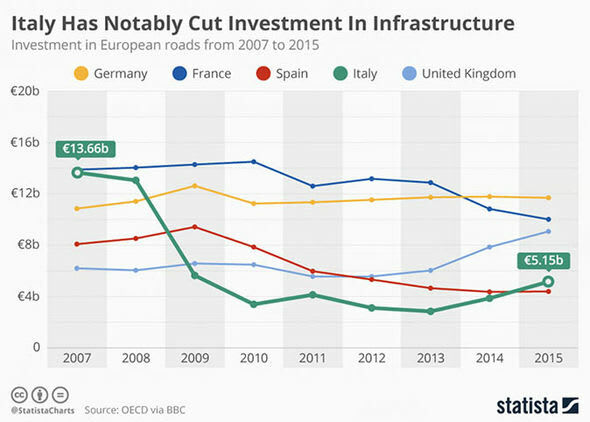 Italy and Spain are at the bottom of infrastructure spending for major European countries. Many bridges built in the 1960s are starting to show signs of deterioration. 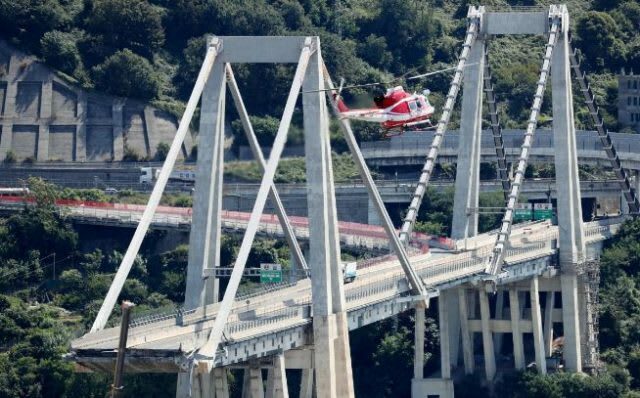 The Morandi Bridge’s collapse wasn’t a freak accident, and it wasn’t an out-of-the-blue surprise. There were warnings at every stage, from design to construction to maintenance, that something was wrong. It could easily happen again. 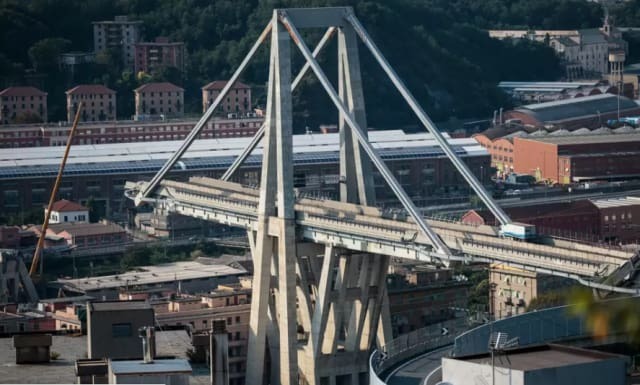 While few bridges share Morandi’s questionable design, many Italian bridges were made around the same time and could be weakened by the same deficient concrete. Furthermore, the drop in Italian infrastructure spending has meant there is less money for maintenance and inspection of pre-existing structures. Hopefully, the public outcry after the recent collapse will push Italy’s new government to investigate and invest in its infrastructure.